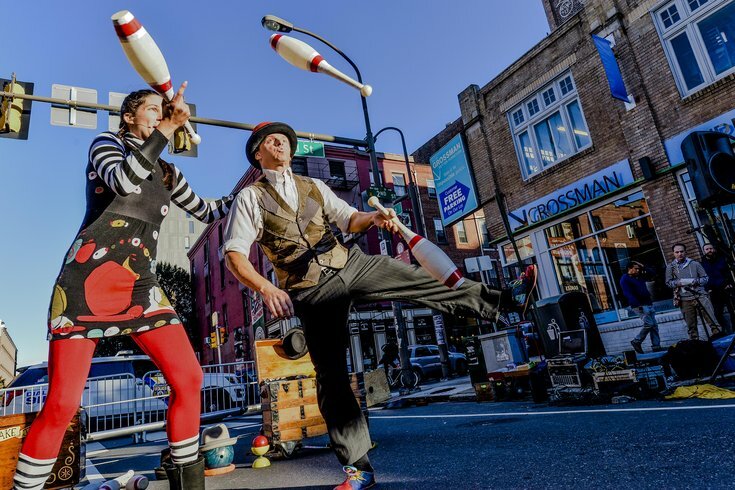 Give and Take Jugglers at Old City Fest. The 2018 Old City Fest will take place Sunday, Oct. 7. Several blocks will closed off to traffic for the all-day event, which will run from 11 a.m. to 6 p.m. In the cobblestone streets, there will be a stage with live music, fashion shows, circus performers and more than 100 neighborhood vendors selling food, drink, clothes and artwork. The annual event highlights Old City's designers, restaurants, retailers, galleries, theater, culture, history and architecture. This year, there will be performances by Chill Moody and the West Philadelphia Orchestra, as well as dueling pianos in the street from Jolly’s Piano Bar. For kids, there will be historic chocolate-making demonstrations in the Family Fun Zone, plus a magician. Admission to Old City Fest is free. The festival will take place on Third Street, from Market to Race, and Arch Street, from Second to Fourth.